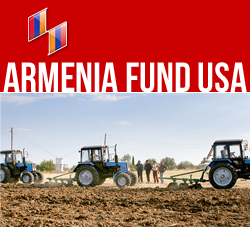 NEW YORK, New York — Hayastan All-Armenia Fund, with the sponsorship of Nshan Devejian of Argentina, has started the construction of a community center in the village of Bavra, in the Shirak region of Armenia. The two-storied building will encompass the mayor’s office, events hall, a library and a computer lab. The foundation is already laid and the reinforced-concrete columns of the basement are erected. Works will resume as soon as the weather conditions improve. Bavra with a population of around 570 borders with Georgia. Cattle-breeding is the main occupation of the villagers here. It is noteworthy, that funds raised during the Telethon 2012 will be mainly directed towards construction of community centers in rural regions of Artsakh.